It's amusing to reflect back on the gloom that prevailed at the end of summer. In August, the media was atwitter with fears of a "death cross" in the 50- and 200-day averages of the major indexes, a "Hindenburg Omen," shaky finances in countries whose capitals you couldn't find or pronounce, and all kinds of statistics about the wretched disaster that awaited in a scary September. Only it didn't quite work out that way, and once again we have to be awed by how quickly media sentiment changes. I haven't seen any comments in the newspapers or anti-market blogs about the fact that the so-called "death cross" of early July uncrossed this in September– not sure what the amateur chart-readers would call that, a "life cross"? A "zombie cross"? A "resurrection cross? The fact is the Hindenburg Omen didn't augur anything but big losses for short-sellers. One lesson we can draw from that is not to put much faith in random scary indicators – particularly when the market is generally rising, corporate earnings are growing, inflation is low, interest rates are low and the credit market is in a full-tilt bull market. Even though the bear market ended 18 months ago, and the recession ended 15 months ago, I realize that many people are still looking over their shoulders for the boogeyman to re-appear. And you know, he just might. But the farther away we get from the crisis, the closer we are to healing and the more the government and companies are doing to heal and grow again. Stocks advanced in the first three weeks of September with a remarkable uniformity.. Every time the market dipped for half an hour, buyers shook off sellers and threw more money at virtually anything with a pulse. Small, large, drugs, steel, chips, foreign, domestic, it was all good. No discretion required. All the major U.S. indexes closed with gains of around 0.4%, and are on track to close out the best September in 70 years. It's as if the market passed a "No Index Left Behind" act that went into effect on the first of the month, as you can see in the chart below. The upside came despite a couple of soundings on the U.S. economy that would not normally be considered positive. So it just goes to show that much of the potential negativity was already discounted into stock values during a tough spring and summer that served as a crucible of value. You might say that the spirit of the past four months has been the inverse of the old "buy the rumor and sell the news." That is, you've had to "sell the rumor and buy the news." The market gods love to turn cliches on their heads sometimes as they exercise their right to be recreationally evil. One piece of negative news last week: Conference Board data showed that consumer confidence is being drained by high unemployment, rising gasoline prices, equity prices that remain well below old highs and a renewed decline in house prices. The report suggested that the outlook for consumption growth is ominous. Yet it appears that share prices already went down in anticipation of this during the summer. So now that the news is out, they can levitate. It's just another example of stocks living in a reverso world that you need a decoder ring to interpret. If you weren't handed the decoder ring with your brokerage application, here is all you really need to know: The economy and the stock market have virtually no connection most of the time. All that economic data you hear about in the financial media is virtually meaningless to stocks. The only pieces of information you need to know about equities besides direct measures of their demand and supply are a) interest rates and b) inflation rates. Everything else is noise. If interest rates are low, inflation is low and aggregate corporate earnings growth is rising, stocks will advance because price/earnings multiples will swell. Higher earnings plus higher P/E ratios equal a higher stock market. It's pretty simple. Add a declining dollar, and you can put it on auto-pilot, though naturally you should expect turbulence. Of course it's never that easy, right? For instance, how do we know if earnings are going to grow? A lot of experts are saying earnings have peaked, after all. And then there's always a big debate about whether inflation is right around the corner, and if the Fed is about to lift interest rates. And that brings us to what has made this particular stretch of time so fascinating. Because last week, the Fed told us in no uncertain terms that, due in part to anemic output and employment growth, it believes a) inflation is too low; and b) it is unlikely to lift rates for at least a year. I told you at the time that this was an epic statement, but it took a couple of days for the idea to sink in. In the past five days, investors seem to have realized that the Fed essentially announced that two of the pillars of a bull cycle are in place. And they have lifted stocks at every opportunity since. I hope you see how this is all fitting together. When news of weak consumer confidence emerges, investors take that to mean that the Fed will remain steadfast in its view that inflation pressures are low and that it should keep rates near zero. Flip your decoder ring to stun, because this was a classic example of a time when bad news equals good news. Naturally there are growing signs that the rally has gone too far too fast. The bulls-bears ratio of the American Association of Individual Investors poll of individual investors last week showed the highest number of bulls to bears since early January this year — two weeks before the winter peak in prices led to an 8.0% drop. Yet there are other measures of complacency that are not ringing a bell. The CBOE Volatility Index is nowhere near its levels of the spring, which means options speculators are still worried. And the Smart Money / Dumb Money Confidence Spread, a measure developed and maintained exclusively by Jason Goepfert, which was ringing off the hook with over-exuberance and complacency back in April, is neutral now. So there are clearly reasons to be cautious, but that's not the same as being bearish. It just means that this is a time to be alert to the likelihood of a "re-set" on the horizon — a time when institutions that have not yet done as much buying at lower prices manufacture a reason for the market to suffer a setback. As you can see in the chart above, a "Step 6" similar to what we saw back in the autumn of last year would be perfectly normal and help to extend the longevity of this bull cycle. If such a move were to materialize, my studies show it would terminate at around 1,062 on the S&P 500. That might feel like the end of the world at the time, but it would really just give us one more chance to buy ahead of the next upturn, which could be epic. I'll offer advice on cushioning the blow if it appears ready to materialize. In summary, it's always a great idea to be cautious, but don't let it keep you from using the capital markets to your advantage as a trader. I always keep an eye out for danger, but dragging an anchor around is a tough way to sail. As you can see above, the Nasdaq 100 is almost back to its April peak after its summer swoon, and I expect that level to be exceeded before long. The big data points of the week in the United States were a positive read on second quarter gross domestic product (GDP), lower initial jobless claims and an improvement in Midwest manufacturing activity, as seen in regional Federal Reserve reports. On the negative side of the ledger was a report from bank analyst Meredith Whitney that the finances of a bunch of U.S. cities are doing down in flames, and will need federal rescues. Well, you know, what are friends for. — The ECRI Weekly Leading Index (WLI) continued to improve, its growth rate up-shifting to -7.8% from -8.7%. That's a whole percentage point, which is a lot. This is my favorite forward-looking measure because of its proven ability to look around corners. The WLI is forecasting a moderation in the slowdown of U.S. GDP growth. That's not the same as an acceleration yet, but give it time. As I've said the past few weeks, when the WLI turns higher like this, it's always unexpected and disbelieved — and that is when you can reap the best rewards. — Second-quarter GDP was revised up a tick. The second quarter ended with a whimper despite a very small upward revision in the latest report, to 1.7% from 1.6%. Unfortunately the added growth was not from the mostly higher estimate for inventories. While that is not ideal, there is no real inventory overhang, as supplies of things are still relatively low vs. sales. Modest gains in personal consumption in the first two months of the third quarter add to that argument. Most bets are putting Q3 GDP growth at around 2.1% annualized. That's not great for this stage of a recovery, but it's nowhere near the "follow-on recession" category. — Personal income rose along with personal spending. Odds of another recession have gone down with recent, moderately good news on personal income. If the consumer sector is holding up, it is hard for the overall economy to slide since households make up 75% of GDP. — Modest growth in average hourly earnings, private employment, and steady or firming weekly hours is gradually boosting wages and salaries. Personal income in August advanced 0.5%, following a 0.2% rise in July, beating a 0.3% expectation. A big part of the uptick came from a jump in government unemployment benefits as emergency benefits were reinstated. Yet there was strength in the wages & salaries component: + 0.3% after +0.4% in July. Private industry wages & salaries rose a sharp 0.5% in August, matching the July gain. — Inflation was a smidge higher than usual at the headline level but still quite subdued at the core, up 0.2% in both August and July, with a core rate of 0.1%. This is the rate that the Fed worries is too low, as the central bank's preferred range is 1.75% to 2%. — With inflation below target and personal income rising slightly you get a combination that many observers believe is more likely to result in new quantitative easing from the Fed. 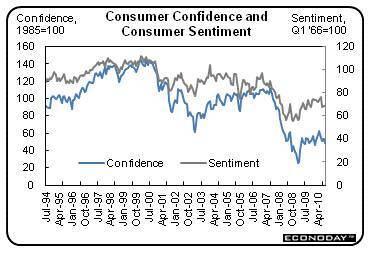 — Consumer confidence and sentiment come in mixed but still weak. When you consider that people are spending at a reasonably strong pace, you would never guess how gloomy the consumer mood is. The Conference Board's index fell nearly five points in September to 48.5 for the lowest level since the beginning of the year. And worries still focus on the job market. Those saying jobs are currently hard to get rose four tenths to 46.1% for the largest share since March. — Consumers see companies as not engaged in healthy hiring now or down the road. Employment expectations six months out show sharp deterioration. — Consumers expecting an increase in their income six months out are down four tenths to 10.2% for the lowest share since February. They may simply be overstating the lack of income progress. Confidence numbers are in line with continued high unemployment but out of sync with aggregate income gains and recent increases in spending. — Reuters/University of Michigan consumer sentiment index is showing improvement on the margin over the last two weeks of September, mostly in leading expectations component. — Motor vehicle sales revved up a bit. Unit sales of North American made cars and light trucks came in at an 8.6 million annual rate in September, up from 8.3 million in August. This indicates that at least those with jobs feel secure enough to go car shopping. This increases the odds of healthy numbers for September retail sales and personal consumption and even third quarter GDP. — Manufacturing positive overall, but new orders less robust. 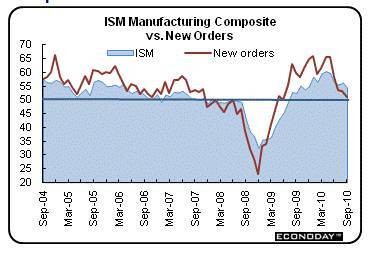 ISM data shows manufacturing is still growing at a decent pace, but new orders suggest it may not hold up so well. The manufacturing composite posted at 54.4 for September, still notably above breakeven of 50 but down from 56.7 in August. Strength was in production, employment, and inventories. — New orders index in September decelerated to 51.1 from 53.1 in August. This is way below a recent high of 65.7 seen as recently as May. The sluggish new orders number for September is still positive (above 50) and indicates very modest growth. But a key question is whether manufacturers are looking past volatility in orders. Will manufacturers want to add to factory payrolls if they really believe production is slowing? Huge question for the fourth quarter. — Chicago area bucks the trend and accelerates. The Chicago Managers Index jumped to 60.4 in September from 56.7 in August (breakeven of 50). The higher index number reflects accelerating growth in Chicago-area businesses. New orders were up, in contrast to the whole country. But it's just one smallish area so no reason to think it's a trend. — Case-Shiller home price index softens. Since the deadline for special tax credits for homebuyers ended in April, home prices have felt the dip in demand. Data show the S&P Case Shiller Home Price Index (10-city composite) flat in July after rising 0.3% the month before. However, this index is based on a 3 month moving average of underlying data, meaning prices actually declined in July. Year-on-year rates are down to 4% in July from 5.5% in May. Weakness in the latest month was led by price contraction in trouble spots in the West and in Florida. The bottom line is that the third quarter strengthened over the second quarter but the data is far from showing a robust uptrend heading into Q4. Consumer spending is the wild card, as it is gaining despite a glum mood by consumers. Manufacturing is decelerating but is always volatile, so don't rush to judgment. In summary, the overall U.S. economy is just plain sluggish — which is all the more reason to continue to focus overseas for the bulk of our investing. Highlights ahead are the monthly biggie — the employment situation report for September, which prints on Friday, Oct. 8. It will be previewed by the two main precursors of the week: Challenger Job Cut Report and ADP on Wednesday, and initial claims and Monster Employment Index on Thursday. Also the meat of Q3 earnings reporting kicks off on Friday with a report from Alcoa Inc. (NYSE: AA). Monday: September factory orders. They were down 1.3% in August after rising 0.1% in July and 0.6% in June. Consensus forecast:: down 0.33%. Earnings: The Mosaic Company (NYSE: MOS). Tuesday: SeptemberISM Non-manufacturing Survey. It fell 3 in August to 51.3, just a little over the breakeven level that signals growth. Consensus: 52.0. 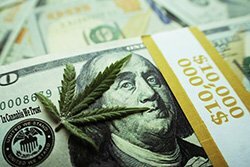 Earnings: Diamond Foods Inc. (Nasdaq: DMND), Wolverine World Wide Inc. (NYSE: WWW), Yum! Brands Inc. (NYSE: YUM). Wednesday. Challenger Job Cut Report and ADP National Employment Report for September. Earnings: Monsanto Company (NYSE: MON), Costco Wholesale Corp. (Nasdaq: COST), Constellation Brands Inc. (NYSE: STZ), Marriott International Inc. (NYSE: MAR). Thursday: Initial jobless claims. Last one was a nice fall of 16,000 to 453,000 and four-week average was down by 30,000 from a month earlier. Consensus: slight drop to 450,000. Consumer credit was outstanding for August. It contracted $3.6 billion in July and $1 billion the month before. Consensus expects a big $4 billion drop, with a range of -$7.5 billion to -$2.5 billion. Earnings: Pepsico Inc. (NYSE: PEP), Alcoa Inc. (NYSE: AA), Micron Technology Inc. (Nasdaq: MU). Friday: Non-farm payrolls. They slipped 54,000 in August after falling 54,000 in July, though much of that was Census workers. Private non-farm employment rose 67,000 in August after a 107,000 boost in July. Initial claims have been coming down. Consensus calls for a fall of 75,000 to a gain of 25,000.
lol….ohhhh….OK. Yeah, we are certainly in a recovery alright. Do you work for the BLS? Do you believe in all those numbers? Why is Emmanuel, Summers and others leaving Obama's side? The only reason the markets are up is because of the dollar….nothing more. Well, you can throw the manipulation of markets due to free money from the fed to primary dealers, and there you have it….the best September since 1939. Imagine that! You can this market. Its no longer about money, money, money. Its about a lot more. And if you think this world is in a joyful, bullish market…you're nuts, just like the people that run this world. This is why you are bullish? Wars across the world. Food crisis. Gas/oil up 8% in less than a week. No substantive changes in banking regulations. The US Gov bankrupt. All major banks bankrupt or insolvent. U6 greater than 17%. Ireland bankrupt. Greece bankrupt. Spain bankrupt. I could go on and on and on. But so-called optimists like yourself are simply full of it. You forgot to mention that the FED was the only buyer with their plunge protection team in action. If and when the new congress takes office that bullish spending the fed is creating in this market will come to an end. So for now YES we might move higher but in the end hyper-inflation comes and goes and again we face deflation. Deflation now would create healing not inflation as you mentioned above. As the dollar/world currencies fall and the market moves higher who actually made money? 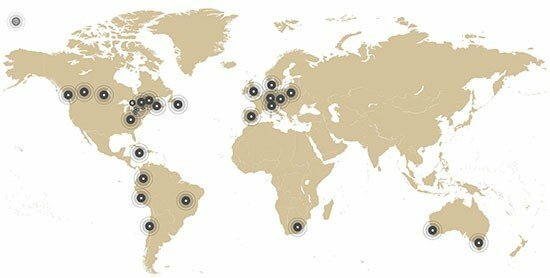 I moved all of my money into the international markets but that doesn't offer any type of protection. The Fed needs to stop and let the markets find their own direction. The FED has spent the USA into bankruptcy and our standard of living will change like no one could ever imagine. All I can say is this…. for protection (if we continue to move higher "inflation") is to buy gold and silver. That is the only protection against a world currency devaluation. If we start to roll over in this Fed propped up market then go into cash.!. "Small, large, drugs, steel, chips, foreign, domestic, it was all good. No discretion required." That's the scary part. When things seem that good you know your buying power is being swindled. The next bomb to hit will be multiple municipalities defaulting on their bonds. While I don't know when this will happen, it seems likely to happen because we all know that most issuers of these bonds are not financially savvy and no one wants to cut spending to the degree needed. The cutbacks will put the day of reckoning further away for now, but they have created a monster. Rallies like this should produce warning signals until the April 2010 highs are cleared. if trillions of dollars(say 5 trillion) was destroyed in 2008 and early 2009,why is printing 5 t inflationary?Does it not merely replace what was destroyed? Marky is clueless and just loves to chatter on. No credibility. I agree with the comments from Chris. We have become immune to the constant meddling from the Administration and Fed. It is clear to all (Greenspan states it over and over) the best thing for America is a rising stock market. However the entire Sept. rally was based on the assumption the Feds will be injecting billions in fresh dollars into the market. The dollar has been destroyed and as an outcome stocks and metals have taken off. Of course, they are stating we need easing but in reality fewer are showing up at the auctions so they are filling the void or a train wreck will happen. So, is this really a healthy market or one where the Admin. and Feds are fire fighting non stop on every front to create that impression of "healing". I trade it but we are living in a fairy tale with a big bag of magic dust in the Admin. and Feds hands.
. . . and all kinds of statistics about the wretched disaster that awaited in a scary September." Then you say, "Only it didn't work out that way, and once again we have to be awed by how quickly media sentimnt changes." worst month for stocks' will ring true again. In your sales pitch, you also said: "September will be a blood bath for inveators." You would be a better man, Mr. Markman, if, instead of purposefully and falsely revising your own history, and attributing "fears" to the "media" to the exclusion of yourself, you had written that you were wrong in adamantly advising your fellow investors that September will be "the worst . . . on record" and that you were happy it didn't turn out that way. As you see, I am not amused in reflecting back on the gloom as write you are, inasmuch as you were, perhaps, the premier gloomsayer of all. The thing about Markman's writing is that it doesn't appear to come from any ongoing logical basis so articles regularly contradict themselves within weeks. In this way JDM can never be wrong, but he can never be right either …..
Why drink the Koolaid if it's bad? What a crock of sH I t ! After reading this I will I have Unscribed to all this lies!!!! !